The honour roll commemorates those from the district who served in World War One. The roll contains the photographs of the soldiers. Originally unveiled in 1917 containing 22 names, additional names were added at a later date and the shield now contains the Australian Coat of Arms. The roll was restored in 1994 by Brenda Goody. On Monday last a large number of residents of Cootharaba attended the local school to witness the unveiling of the honor board erected in the school building. Visitors were present from all parts of the distract, including Crs. A. Parker (Chairman) and J. Hull, who both addressed the large audience present. Mr. H. V. Hatch, in the presence of Mr H. F. Walker, M.L.A., performed the ceremony of unveiling the board, and in a patriotic speech spoke of the good work done at the front by our soldiers, and he sincerely hoped that the great struggle across the ocean would be ended before very long. 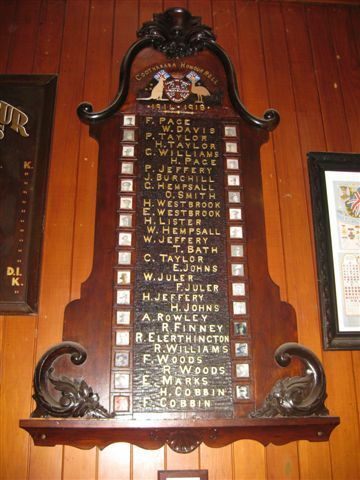 The honour board was the work of Mr. H.W. Page. The name of each soldier (22 in number) has been carved out and gilt, and the photo let in alongside of each name. In the middle of the shield is the kangaroo, representing Australia, and John Bull shaking hands. The work on the shield reflects great credit on Mr Page as a worker of wood. Photos of the board are to be taken, and a copy to be forwarded on to each Cootharaba lad who is serving his King and Country. At night a social and dance was held in the schoolroom, and was largely attended. Gympie Times and Mary River Mining Gazette (Qld), 9 June 1917.